Denim is one of my favourite fabrics and I regularly double and even triple the dose in my outfits. This is the case today as I'm wearing this shirt dress with a denim jacket but I made sure to choose two very distinct shades. The clash thus created brings additional interest to tthe double denim gimmick that is in the process of becoming a classic as it's been reproduced so many times since the inspiring Chloé fashion show... Then, which best colour than red to set fire to the look? I love it dear, this look is perfect!!!!!! This is so rocking chic look! I absolutely love this denim on denim look! Beautiful combination! 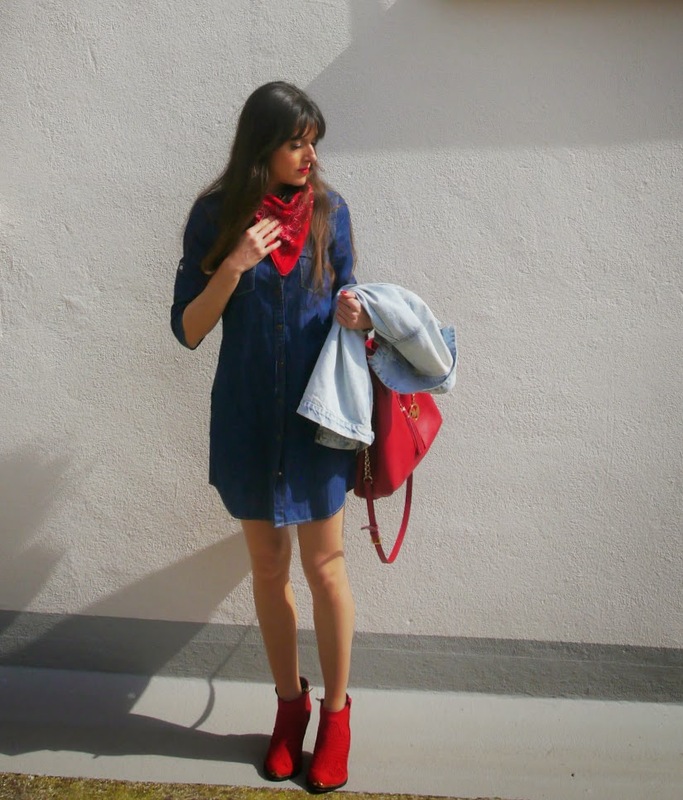 Love the red and denim! great dress, i love it!! il denim abbinato così al rosso è davvero pazzesco. bellissima e che luce splendida in queste foto. 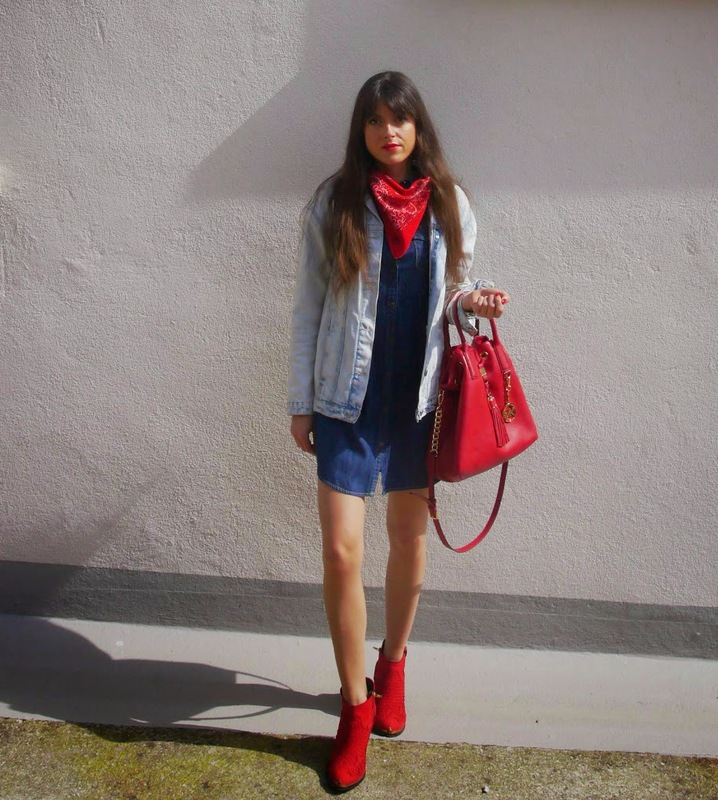 Bellissimo questo look in total denim con un tocco rosso, gli stivaletti sono splendidi! I'm denim girl as well. I've been looking for red bag and shoes and you have nailed this look with your gorgeous red accessories perfectly. You look fabulous! So cute outfit! You have a great taste! Those boots would look really cool with a boho inspired lace dress.Agree? yOU are rocking that double denim outfit wonderfully. Really great look! I love the dress! 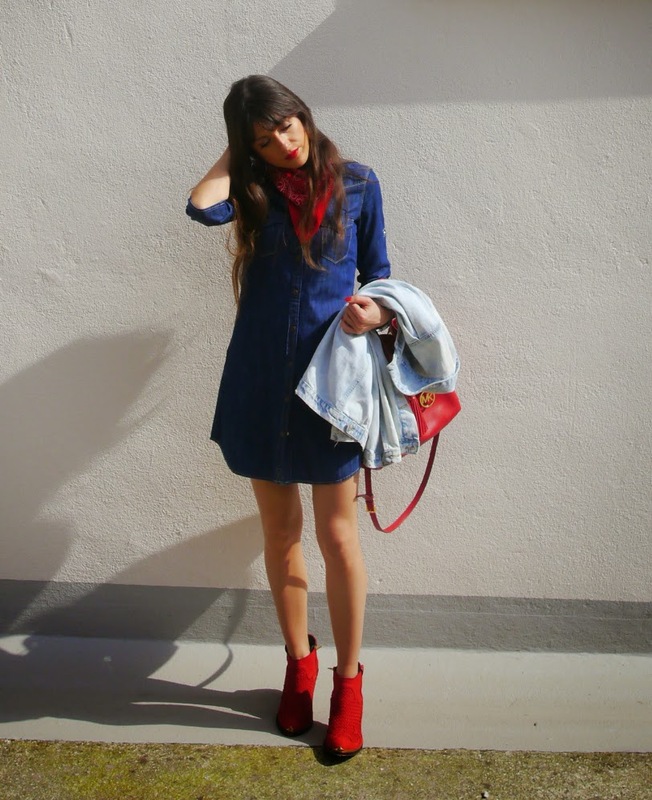 In love with your denim dress! I think denim on denim works quite well. I love the pop of red too. Great outfit! Stai benissimo, mi piace molto la borsa e gli stivaletti! I have never tried the denim on denim look as I am a little nervous to make it right look but seeing you style it makes me want to try. Love the way it looks on you and you are right the denim colors should be different to make the outfit work! I like the beautiful red accessories to make the outfit pop! How awesome that you have had that bandanna for so long as it looks still in perfect shape. What a special piece to cherish forever! Just adore the boots! Why don't we have Topshop here! Why!? 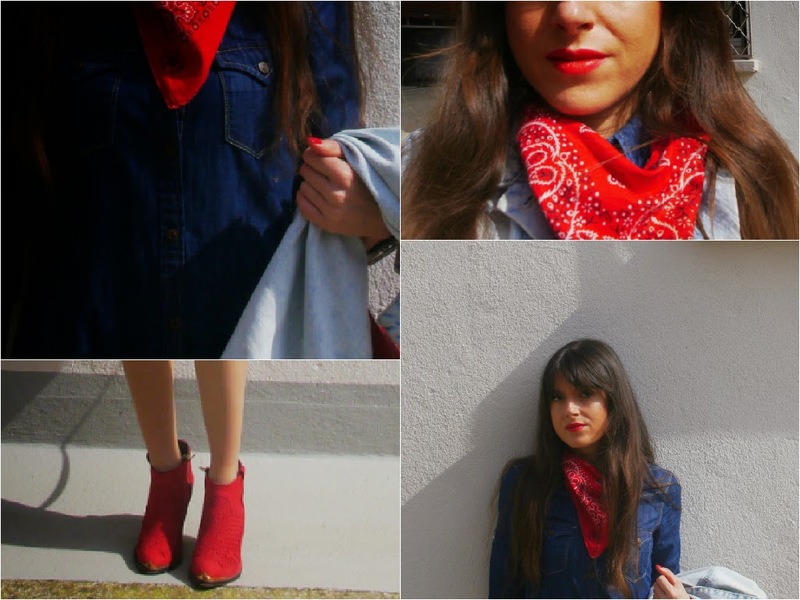 J'adore le duo jean-accessoires rouges ! Ce style te va trop bien. Splendido questo look, sei super trendy Jeanne!!! I love how you style denim. It's one of my favorite fabrics too. You look amazing! I love the boots and the dress. The colors are just popping! Che bella, stupenda la borsa!!!! 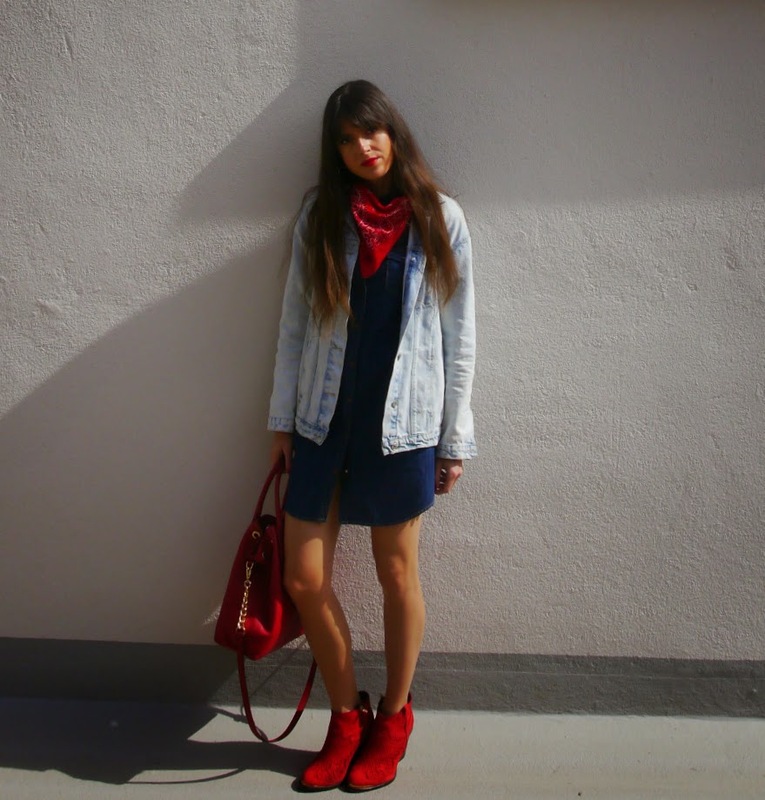 You look fantastic, I love this denim and red combination. I love that red color with the denim - you are so pulling the denim outfit off!! Such a stunning and very cool outfit..
Que guapa!! me encantan los toque de rojo!! love your outift <3 you look fantastic ! Those boots are too nice! Perfect denim look, those boots are so cool and stylish! You look great! Amazing! I love your dress! I love your outfit, you look gorgeous! Those shoes are everything! coucou dis donc ce sac rouge c'est pas celui que j'avais voulu acheter, moi ? Maintenant que tu m'y fait penser, peut-être bien que oui... Un modèle approchant en tous cas... Bisous! !